The place of the dealer button on the table is determined randomly. The thirteen spades cards are used and are placed face down on the table. Each player selects a card, starting from the first seat and moving clockwise. After the player has made his selection, the dealer reveals the selected card and gives it to the player it belongs to. The dealer's button is placed in front of the player with the highest ranking card. If there are only two players on the table (heads up), the player who has the dealer button in front of him makes the small blind bet and must also act first for the game to get started.If two (2) minutes go by, any player at the table, active or not, is entitled to ask for "time". The player, whose turn it is to act, shall have one additional minute to decide. If the additional minute elapses without the player having made a decision, a ten (10) seconds countdown will follow.When a new player enters the poker room and there are vacant seats at more than one tables of the same type, the room supervisor decides at which table the player will be seated. The player cannot choose the table at which they will be seated. Players may bet on multiple limits (2/5, 5/10, etc.) but not on a specific table. If a seat opens in one of the limits, they may keep their turn on the remaining ones. When a new player enters the poker room and there are vacant seats at more than one tables of the same type, the poker room supervisor takes on the responsibility of determining at which table the player will be seated. The player cannot choose the table at which they will be seated. Players may only change tables or seats if the house approves these changes. Players have five (5) minutes to get to room and take their seat at the table. If the player does not show up within this period of five (5) minutes, the next player on the waiting list shall be notified. If a player states he will be absent from the table for a specific period (max. fifteen (15) minutes), then the first player on the waiting list is entitled to "play temporarily", that is to take the vacant seat at the table and either make the big blind or wait for his turn to make the big blind. When the original player returns to the table, they shall make the remaining blind bets. If a table closes and the players wish to keep playing, then there shall be a draw for the available open seats at other tables. If there are no more available seats, then their names shall be entered in the waiting list in the order specified by the draw. If the house decides to change the commission rate or even the commission type, within the framework set out by the law, the players shall be notified in advance and not during the game, through announcements posted at visible spots on each table or in the game room or in the poker room. The betting line is considered an indication line and the house may return cards which have crossed the line or consider them valid. Acting out of turn during a Heads up: If the second player performs an essential action (a raise) out of turn and the first player to check, the out of turn action is binding. If the first player chooses to make a smaller bet than the one made in the out-of-turn raise, the second player may either match the bet or fold. If the second player folds, the out-of-turn bet is revoked. If the first player make a bet, it is revoked. If the first player makes a bet which exceeds the amount of the out-of-turn raise and the second player does not match the bet but instead folds, then the out-of-turn bets are considered invalid and remain in the Pot. Each player's chips must be in front of their seat at the table, so that they are visible by everyone sitting at the table. 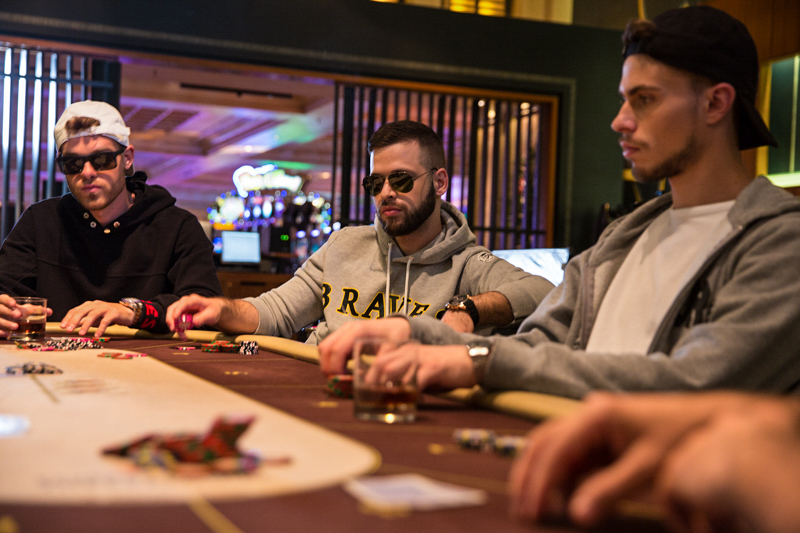 If a player, without having stated it in advance, places in front of him two or more chips with a total value exceeding the minimum raise, the total value shall be considered as a raise. If the bet is bigger than the previous one but smaller than the minimum required raise, then: a) if the value of the chips is greater than half of the amount required for a raise (50% of the raise or more), the player has to add the rest of the amount and raise, b) if the value of the chips is less than half of the amount required for a raise, the action is considered as a simple Call and the player must remove the chips. If a smaller bet than the previous one is made, the player must either add chips to match the required amount or pass. If the player passes, the bet they placed is not returned; it is added to the Pot. 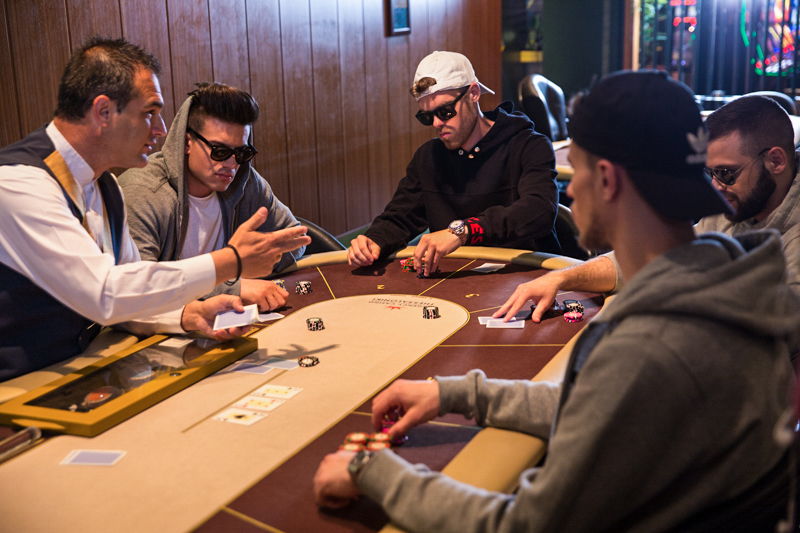 The players place their respective blind bets before the dealer cuts the deck. The players are only allowed to have on the table their cards, their chips and a special card protection chip. The special chip is placed on the cards for protection and it is usually round and large. The house may prohibit the use of a special chip which it considers unsuitable for this purpose. Cards which have fallen off the table during the initial dealing shall be considered exposed. Players may choose not to reveal their cards and give them straight to the dealer. The dealer will place them face down in the discard pile. Any oral announcement of an action is binding. The Poker room supervisor or any other person with a higher post may receive or deliver cards which are off the table, as well as check the players' cards. If a betting round has not been completed yet and a player intentionally reveals his hand, the hand is dead while his bets will remain in the Pot. Players are not allowed to exchange or disclose information regarding their hand. An infringement of this rule may lead to the hand been declared dead. Furthermore, players may communicate with each other during a hand only in Greek or English. The house follows the "one stack per night" rule. If a player leaves a table with a specific amount of money and wishes to be seated at the same table again, there are two (2) options: a) return with the amount they had when they left, if less than two (2) hours have passed since the time the player left the table. b) return with the participation amount required according to the game limit, if more than two (2) hours have passed. Players may wear sunglasses and hats during the game. • Players may use portable music devices, such as iPods and mobile phones, provided these are not placed on the table and players do not use them during a hand. Mobile phones are not allowed during Poker tournaments. Players may not stand while in the Poker room. The cards and chips of all players must always be in plain sight within the perimeter of the table, thus ensuring the integrity of the game. Prospective players inside the casino may register in the waiting list; registration by telephone is not allowed for any player. All players must indicate and announce their actions (check, call, raise, fold) and then act accordingly. In tables with a 5/10 or higher betting limit, only bets which are multiples of €5 will be accepted, unless a player has gone all-in. In tables with a 2/5 betting limit, only bets which are multiples of €1 will be accepted. 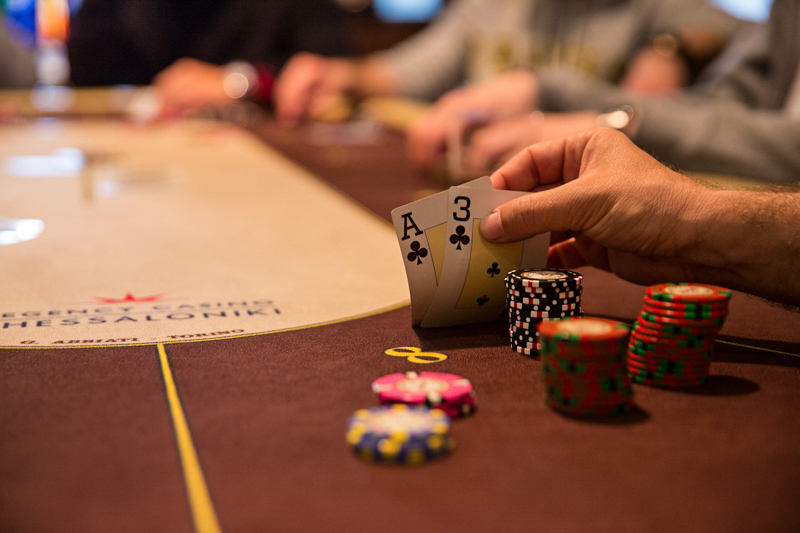 In order for a player to win any part of the Pot, he must reveal all his cards (2 for Hold'em, 4 for Omaha) on the table at the same time, whether they were part of the five-card hand or not, so that they can claim a part of the Port. In case of a Showdown, when the player intentionally gives his cards to the dealer face down, although he performed the last action and has to reveal his cards, the player will not have the right to claim a part of the Pot and no other player can request to see the lost hand cards. If a player reveals their cards to another player after the hand has been completed, the player will have to reveal his hand to all the players on the table, if asked to do so. The Casino is entitled to declare a player's hand dead, if the player intentionally reveals their cards to another player. If one or more cards are exposed, i.e. revealed, at the fault of a player, they are not dead but remain in the game. Players may not use a calculator, a computer or any other electronic or mechanical device which records or displays or analyses the result or alters the odds or strategy of the game. The same applies for handwritten or other notes that a player might have with him to alter the odds or strategy of the game or to analyze the final result. During a hand, players may not communicate or co-operate with each other or with third parties in any manner whatsoever, with the goal of influencing the result of the game, or to behave in a way which is considered harmful to the integrity of the game. Such offenses shall, at the discretion of the house, result in player's (or the players') hand been declared dead, while the bets placed will remain in the Pot (including compulsory and blind bets) and the players will be removed from the game.